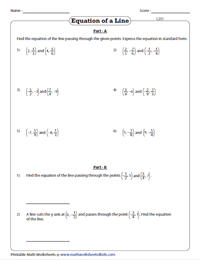 This collection of worksheets will assist students in grasping the basics of finding equation of a line passing through two-points. 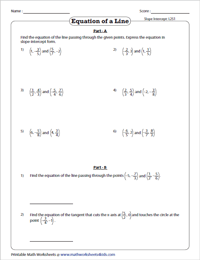 A number of exercises include writing the equation of a line in standard form, slope-intercept form and a series of MCQ worksheets that forms an excellent resource to test your application of the relevant formulae to find the equation of a line for a variety of geometrical figures. A number of free printable worksheets are available for practice. Printing Help - Please do not print worksheets with grids directly from the browser. Kindly download them and print. Find slope using the given points. Apply point-slope formula to find the equation of a line that passes through two points. Express the equation in standard form. At this level of worksheets, x and y coordinates are in the form of integers. Use the given two points, (x1, y1) and (x2, y2) to find the slope and apply point-slope formula to write the equation of a line. Express the equation in standard form. 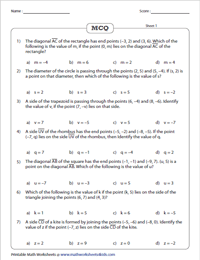 The coordinates in this batch of worksheets are given in the form of fractions. Find the equation of the line by substituting the two given points in two-point formula and express them in slope-intercept form (y = mx + b). The coordinates in this set of worksheets are represented as integers. Write the equation of a line in slope-intercept form (y = mx + b) based on the two points (x1, y1) and (x2, y2) given. This coordinates in this level of worksheets are given in the form of fractions. Test your understanding on finding the equation of a line by applying two-point formula with this exclusive series of MCQ worksheets. Based on the two points given, apply the relevant formula to solve these worksheets based on coordinate geometry. 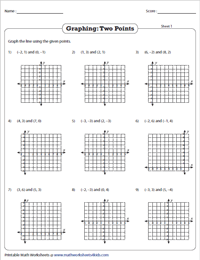 Employ this selection of worksheets to graph the line using the two given points. Plot the points on the grid and graph the line. Each worksheet has nine problems graphing the equation of a line. 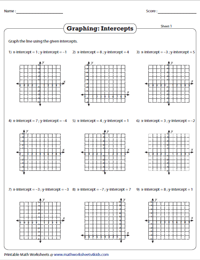 This set of graphing worksheets provide ample practice in graphing the equation of a line based on the given intercepts. Plot the x-intercept and y-intercept on the grid and graph the line.